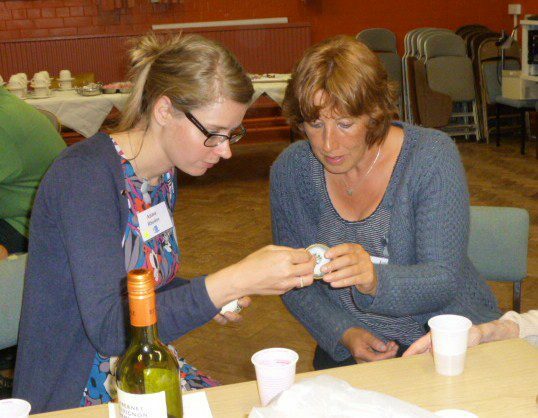 Last month I attended the Northern Ceramic Society’s (NCS) Summer School at Chester University. NCS is the largest ceramic society in the UK. It has nearly 1000 members whose interests range from studio pottery to 18th century butter boats, medieval majolica and kiln technology. 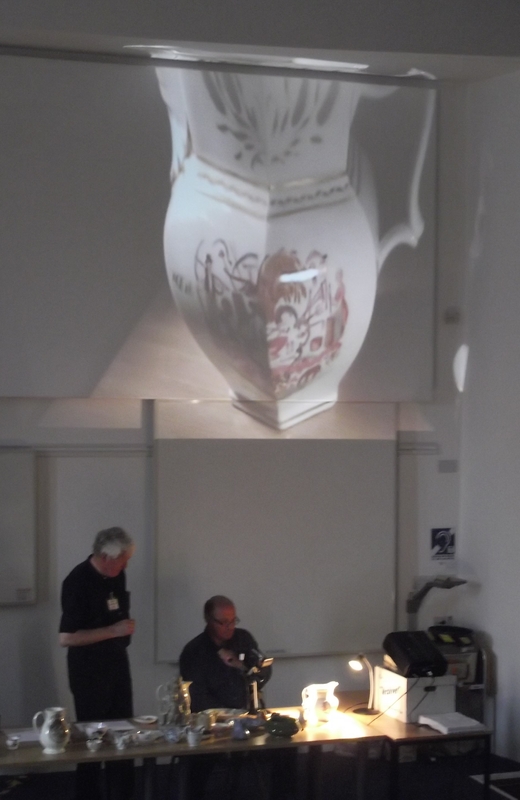 This year the Summer School theme was right up my street, ‘Enlightenment and Discovery; The Ceramic Legacy’. 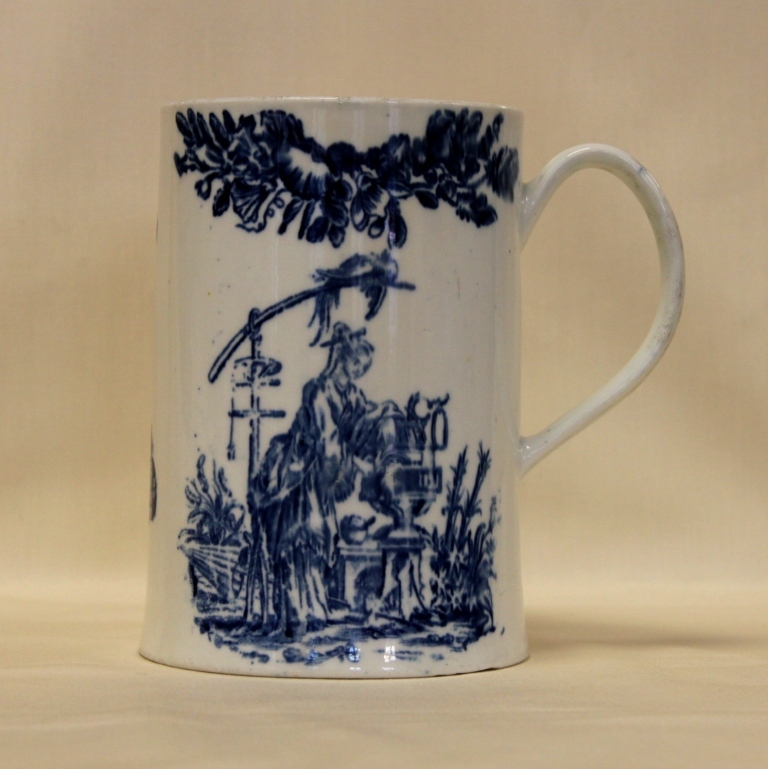 It was a varied lecture programme that explored the way the Enlightenment movement and its legacy shaped ceramics, from key figures such as Josiah Wedgwood through to the influence the Portland Vase had on ceramic design. 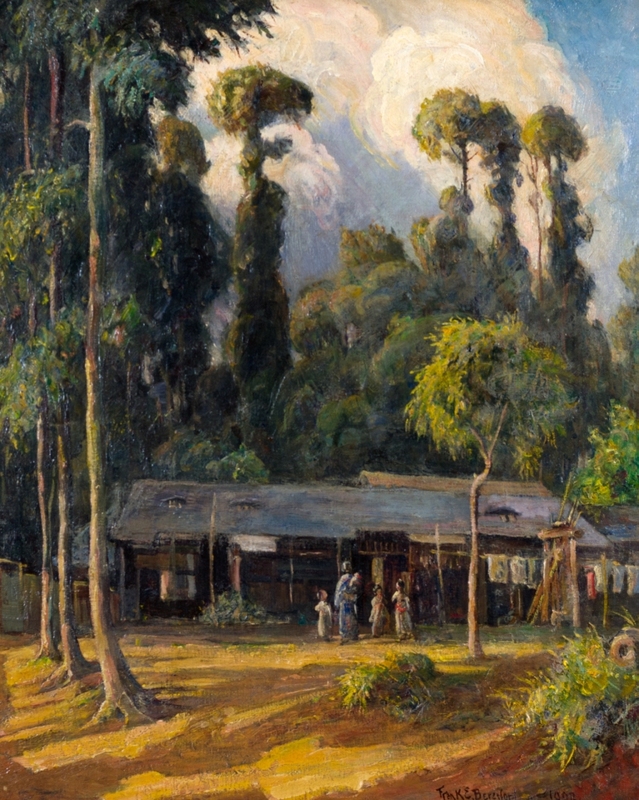 The legacy of the Enlightenment was discussed in terms of Ruskin’s preoccupation with artistic taste, the working conditions at the Stoke Potteries and the spiritual enlightenment that influenced the work of the early 20th century studio potters. It is hard to sum up a 4 day conference succinctly, but some interesting Derbyshire related things cropped up. Dr Oliver Kent in his lecture on the changes to kiln and firing technology 1650 – 1775, discussed the illustrated records of the Swedish traveller Reinhold Angerstein. Angerstein undertook a detailed survey of English Industries, mainly focusing on lead and iron manufacturing. He was himself involved in the Swedish iron industry and was in the UK basically as a spy; examining the quality of the iron, what it was being used for, how it was being produced etc. Angerstein also gives an insight into other industries including ceramics. Oliver’s lecture included Angerstein’s 1754 illustration of the saltglaze kiln at Crich. The kiln had quite a sophisticated fire box that Oliver believed would have reached a high temperature. I know nothing about the pottery at Crich, so this was very interesting and something I plan to look into further. 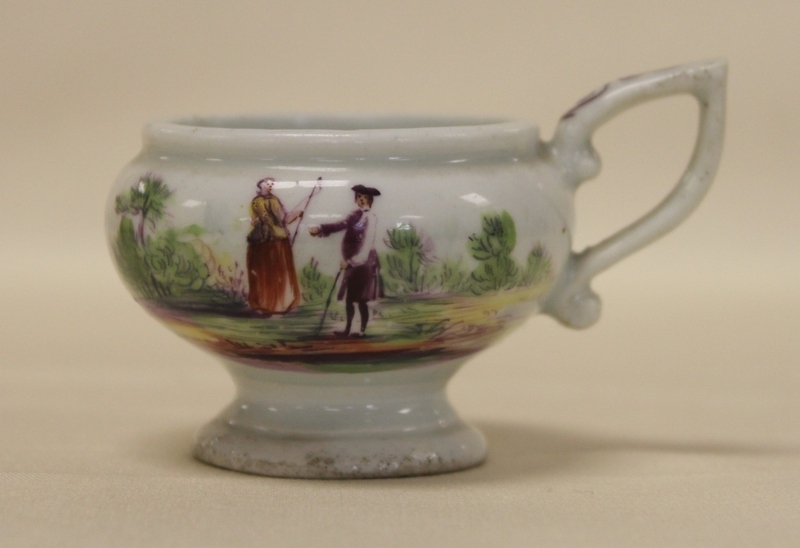 Angerstein recorded the kilns at Derby porcelain including the muffle kiln which was used for Derby figures and he states that at the time of his visit, they were debating installing equipment for throwing bowls and plates. It would have been great if Angerstein had visited the area 25 years later, as I would have been interested to hear what he thought of Richard Arkwight’s Mills – that is, if he had been allowed in! 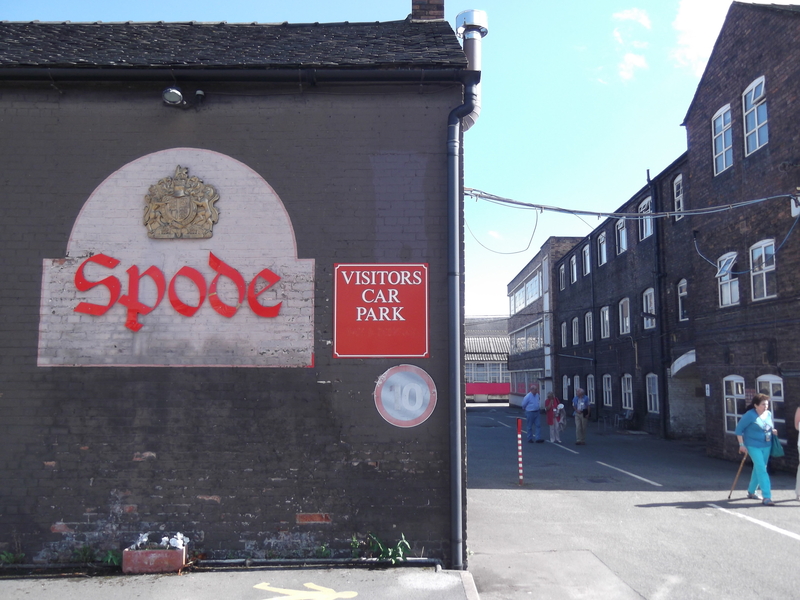 On the Friday we went on a visit to the Spode Works Visitors Centre. This followed a fascinating morning lecture on Spode by Pam Wooliscroft, a company which I previously knew very little about. Anyway back to the Derbyshire links – Wedgwood sourced his barite from Matlock and, along with Thomas Bentley and all good eighteenth century gentleman, he owned a copy of Whitehurst’s Formation of the Earth. 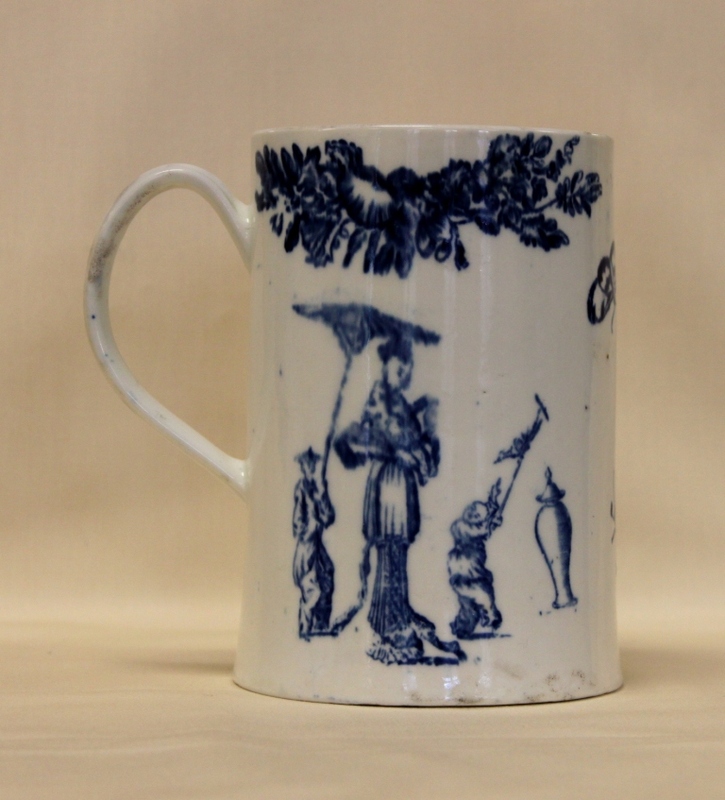 The Portland Vase not only influenced Matthew Boulton’s Blue John ormolu vases and Derby porcelain but it was also copied at the little known Whittington Moor Pottery. I also learnt that Joseph Wright was originally called upon to paint the Wedgwood family portrait, which would have been pretty amazing, although I have to admit that George Stubbs did a decent job. I had a really good time at the Summer School and met a lot of interesting people. 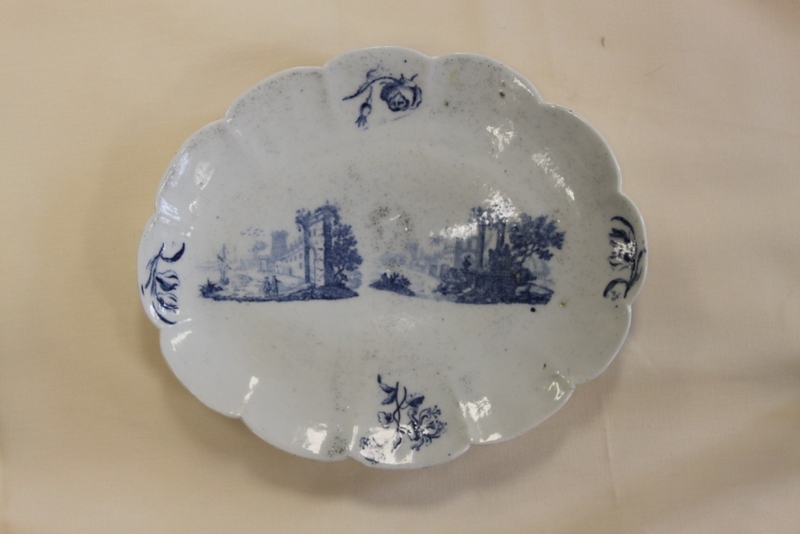 Since being back at work I have had communication with some of the members including being sent an article and images of a porcelain plate depicting Richard Arkwight’s Willersley Castle – Thank you! 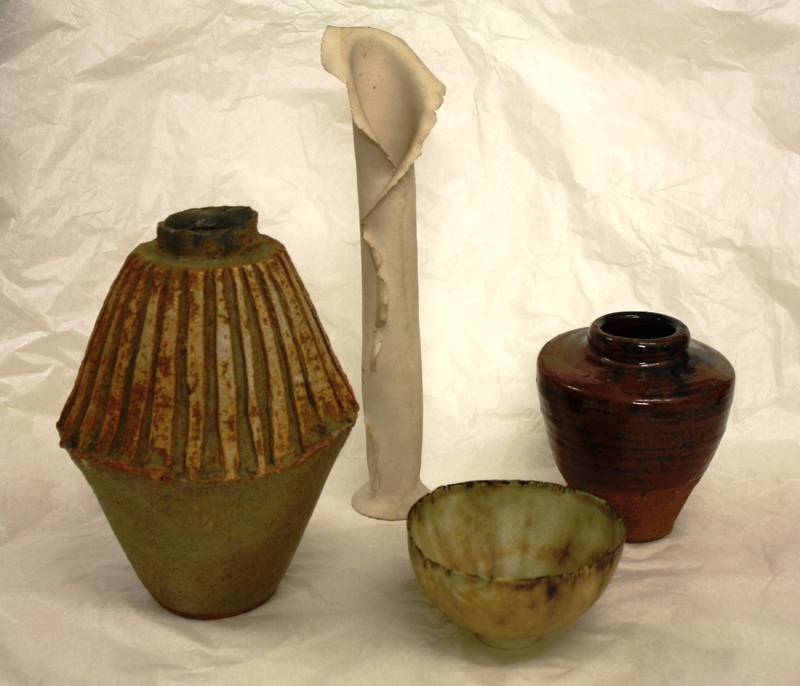 Kathy Niblett’s lecture on the pioneer studio potters has reinvigorated me to tackle the studio pottery that we have at Buxton Museum and Art Gallery, and I am planning a small exhibition at Alfreton Library containing the work of Bernard Leach, Bernard Rooke and Belper born Mary Rogers. I would like to thank the Northern Ceramic School and the anonymous donor who supported the 2013 Dr Geoffrey Godden Bursary, of which I was the recipient. This conference examines the impact of scientific and intellectual cultures in the English East Midland counties of Nottinghamshire, Leicestershire, Derbyshire, Lincolnshire, Northamptonshire and Rutland between 1700 and 1850. Keynote speakers include Professor Ruth Watts of the University of Birmingham and Professor John Beckett of the University of Nottingham. This conference is hosted by the Centre for Identity, Conflict and Representation in the Faculty of Arts, Design and Technology at the University of Derby and will be held at the Enterprise Centre on Bridge Street in Derby, close to the city centre. £20: £15 students and unwaged. Includes refreshments. Anita Hollinshead is giving a talk on Buxton’s mermaid at Derby Museum and Art Gallery on 10th Nov, 11am – 12pm. The mermaid was originally thought to be part-monkey, part-fish, but investigations by Anita and experts at Lincoln University tell a different story…..
For a taster of Anita’s research see here. Matt Edwards is giving a talk about the Enlightenment! project on Friday 2nd November, 1pm – 2pm at Derby Museum and Art Gallery. 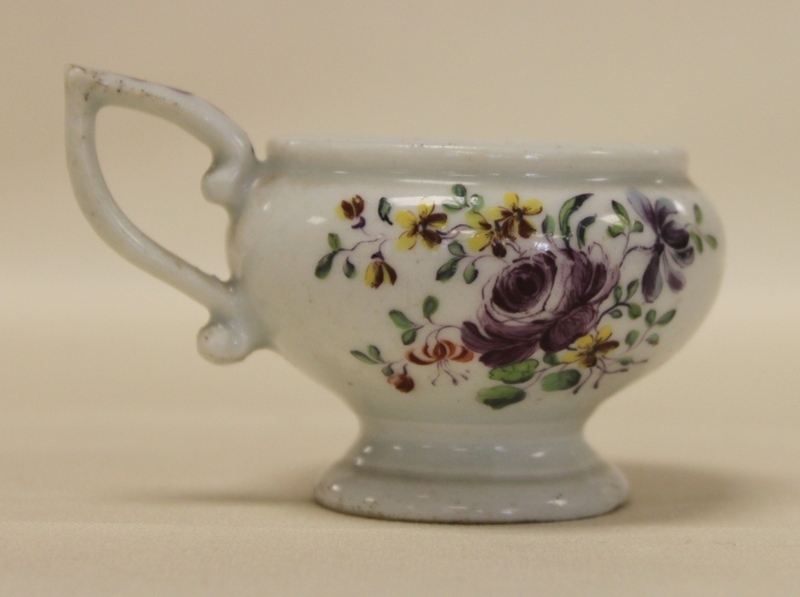 There will be a chance to see some of Derby Museums’ purchases up close and personal at the end of the talk. It is FREE but places are limited so please call Gwen Wilson , Derwent Valley Mills World Heritage Site Administrator, during office hours on 01629 536831. 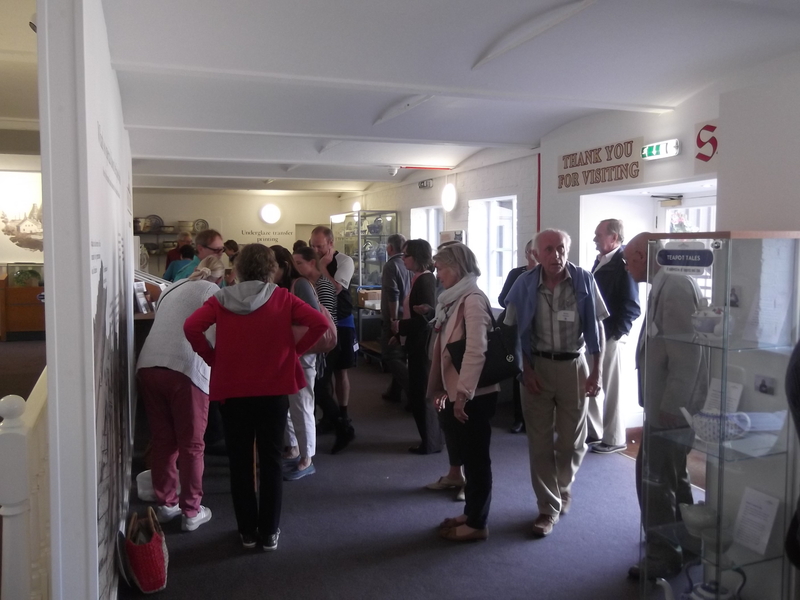 The talk is part of the Derwent Valley Mills World Heritage Site Discovery Days. The festival is in its eighth year and there are over 160 events happening up and down the Valley between 27th October and 4th November. You can see the full programme here. 11.00am -12.30pm, starting from the Joseph Wright Gallery at Derby Museum and Art Gallery. FREE. Suitable for adults. Booking is essential on 01629 536831 (office hours only). Internationally respected 18th century artist, Joseph Wright, had a strong connection to Derby – the place he lived, worked and died. Join the Assistant Head of Museums, Jonathan Wallis, for this fascinating walk around Joseph Wright’s Derby. 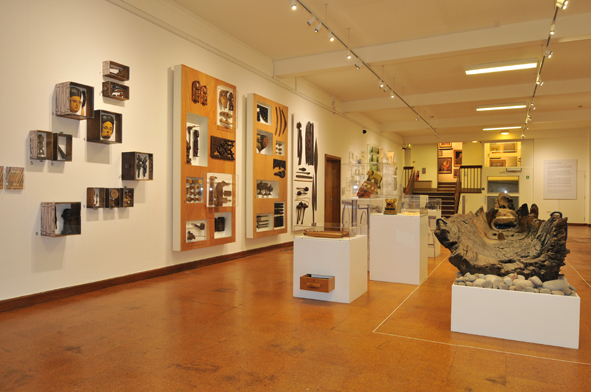 1.00pm – 2.00pm, Derby Museum and Art Gallery. FREE. Suitable for adults. Booking is essential on 01629 536831 (office hours only). Join the Assistant Head of Museums, Jonathan Wallis, for his ever-popular talk on the life and work of the internationally renowned 18th century artist, Joseph Wright. 7.30pm at the Gothic Warehouse, Cromford Wharf. FREE. Pre-booking recommended on 01629 536831 (office hours only). 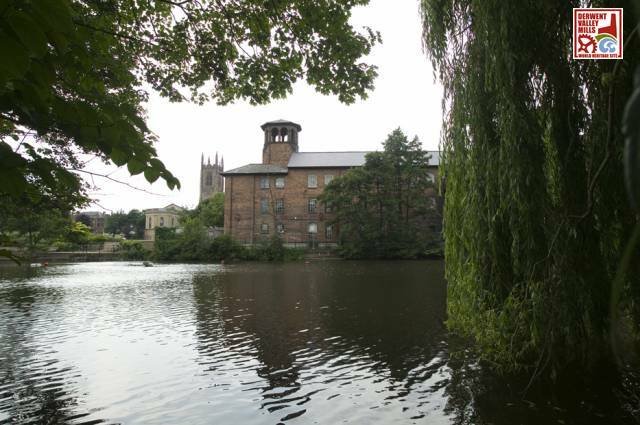 Illustrated talk by Jane Middleton-Smith, to include the history of the mill, the Smedley family and the project to catalogue the company’s unique heritage. 2.00pm – 3.30pm, from outside the Greyhound Inn, Cromford Market Place. FREE. Pre-booking recommended on 01629 536831 (office hours only). Barry Joyce reveals recent research on Alison House, one of the lesser known Arkwright Houses, on a walk from Cromford Village, past the housing built for the mill-workers on North Street. Last week 7 of us from the Enlightenment! team visited Lichfield. We started our day at the Samuel Johnson Birthplace Museum, which is a fantastic museum in the house where Samuel Johnson lived. 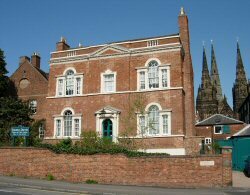 The museum opened in 1901 and houses a great collection of personalia, manuscripts and art relating to Johnson and 18th century Lichfield. In the attic there is a first edition copy of his most famous work, his dictionary which was published in 1755 after 9 years of research and revision. Although Johnson spent most of his life living in Lichfield and London, he was no stranger to Derbyshire. His father Michael Johnson was born in Cubley, Derbyshire and Samuel Johnson visited the County many times, even getting married at St Werburgh’s in Derby in 1735. It is not known why he wed in Derby, but it may have been to escape disapproving family members– his wife Elisabeth was 20 years his senior and considerably wealthier than him and neither side of the family were thrilled with the match. 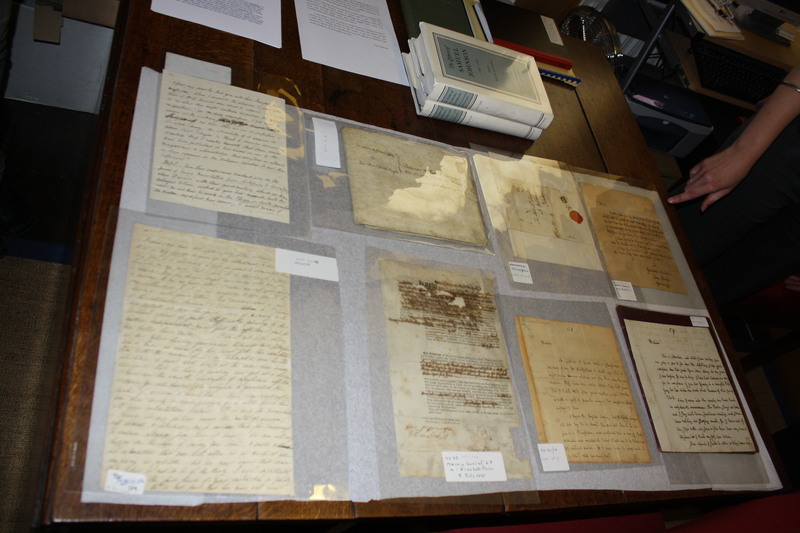 Joanne the Museum Officer got out various Derbyshire related manuscripts for us to look at, including Johnson’s wedding certificate – front row, second from the left. 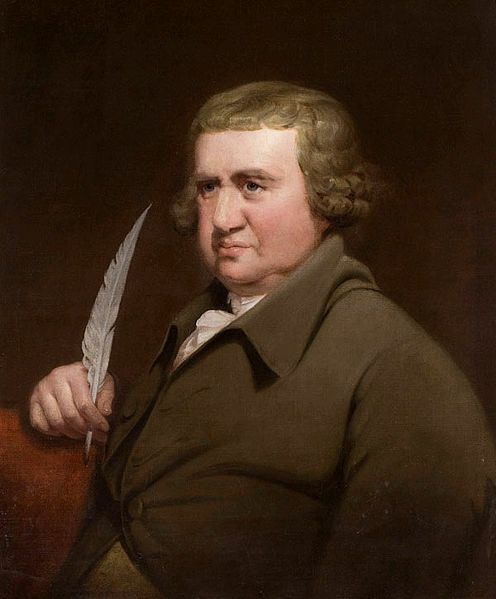 Johnson visited Derbyshire many times with his friend and biographer James Boswell. 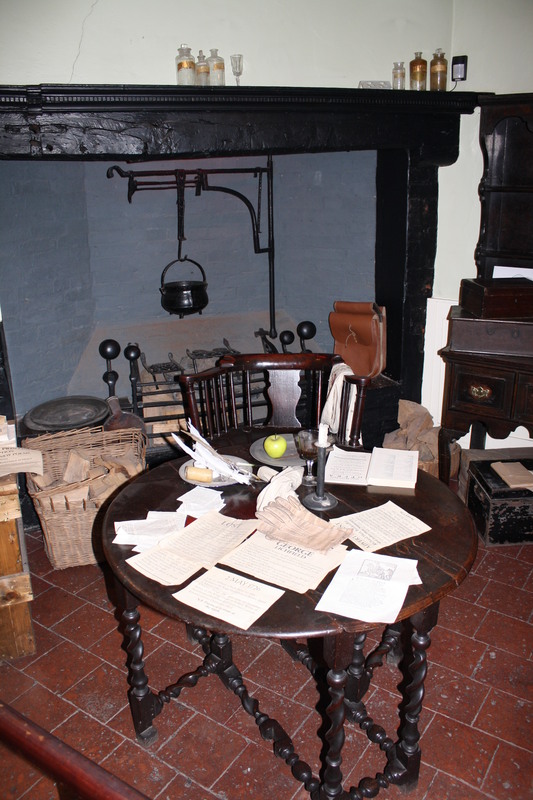 He was good friends with Dr John Taylor who lived at the Manor House in Ashbourne and Taylor’s table from the Manor House is on display at the Birthplace Museum. On a bit of a tangent, but earlier this week I came across a fab watercolour allegedly featuring Samuel Johnson. ‘Vauxhall Gardens’ painted in 1784 by Thomas Rowlandson depicts the fashionable gardens during a concert with people eating, drinking and gossiping. The supper box below the orchestra on the left hand side apparently contains Dr Johnson, Boswell, his friend Mrs Thrale and the novelist and playwright Oliver Goldsmith. (There seems to be some debate about the accuracy of this, not least because by 1784 Goldsworth was a decade dead). One of the women under the tree has been identified as Georgiana the Duchess of Devonshire – Rowlandson has been somewhat kinder in his depiction of her here than in the caricatures that he well known for. Anyway back to Lichfield…. We had a lovely lunch at Chapters, the Cathedral Café and we managed a very quick look into the Cathedral itself. It is an amazing building which we didn’t have to time to do justice. They had on display some of the Staffordshire Hoard plus there is a sculpture by Francis Chantrey, who was born in Norton which was then part of Derbyshire (Yes, I am shamelessly plugging yet another Derbyshire link). In the afternoon we visited Erasmus Darwin’s House. Erasmus was a surgeon, poet and general Enlightenment thinker who amongst other things was the founder of Lichfield’s Botanical Society, Derby’s Philosophical Society and the Lunar Society. The Erasmus Darwin house is an impressive Georgian town house with great views over to the Cathedral. The highlight of the visit for me was Erasmus’ Commonplace Book which was full of drawings of his inventions, scientific musings and medical records. Among his many achievements E.D had a progressive stance on female education. He helped his two illegitimate daughters Susan and Mary set up a school for girls in Ashbounre in 1794. Three years later he published Plan for the Conduct of Female Education, in Boarding Schools. E. Darwin was a serious procreator and had 14 children and many grandchildren including Charles Darwin and Francis Galton. By 1782 Darwin had moved to Derby where he continued to practice medicine. He died in 1802 and is buried at Breadsall Church. Derby Museums and Art Gallery hold collections including his microscope and his portrait by Joseph Wright. There will be a ‘taster’ exhibition opening next summer which will showcase some of the Enlightenment! purchases and will be a chance to trial ideas for the 2014 exhibition. The Exhibitions team at Derby are keen for the exhibition to have a cabinet of curiosity feel and have been visiting museums across England to gain inspiration. 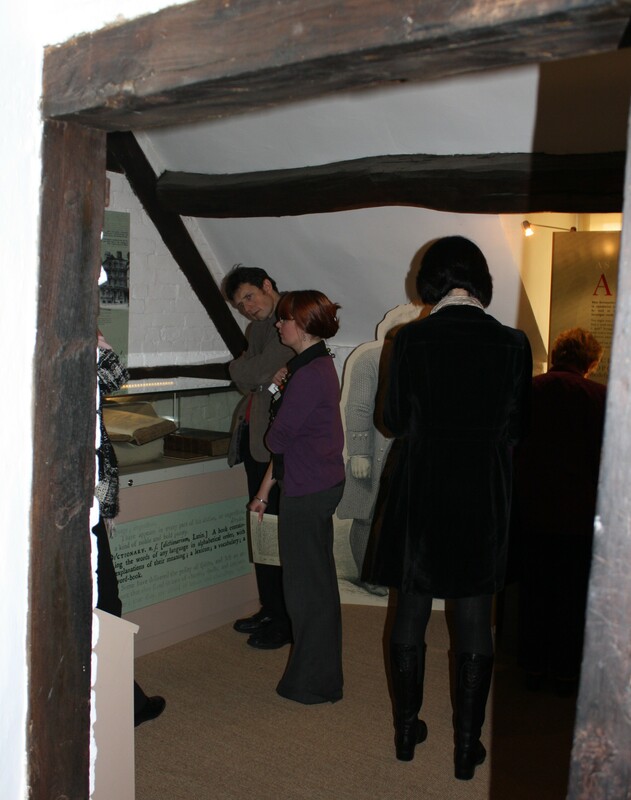 You can find out more about the exhibition and research trips on Derby Museums blog. We shouldn’t overlook the importance of the many wars during the Age of Enlightenment. Towards the end of the American War of Independence (1775-1783), the British Armed Forces were again engaged in battle with Spain and France at the Great Siege of Gibraltar (1779-1783). The French Revolution which followed in 1789 was time of great social change based on Enlightenment principles. The traditional ideals of the state and authority were being challenged in favour of equality and human rights. 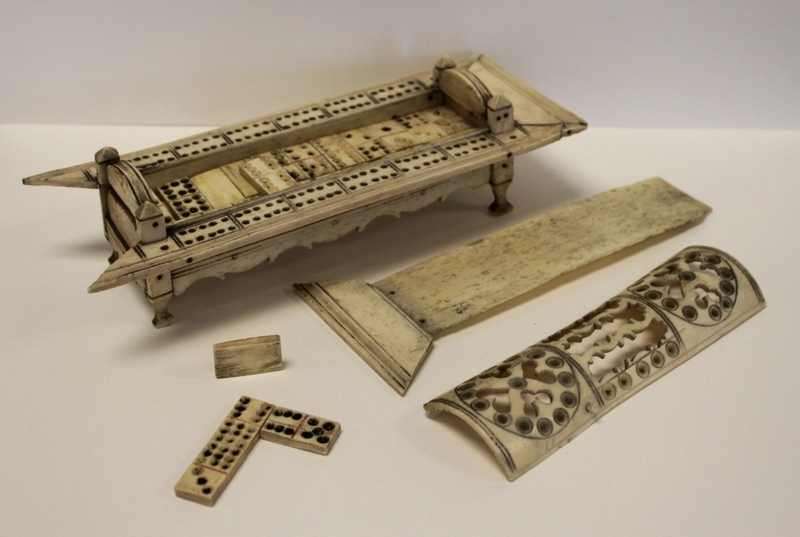 Derby Museums have purchased this cribbage and dominoes set, intricately carved from bone by a French prisoner of war. A label on the underside is handwritten and reads ‘Presented by ~ Gardiner to his sister Ann who married William Peach of Normanton by Derby about 1798, Brought from France’. We have found a reference to a William Peach of Normanton aged 83 buried 18th February 1843 at Normanton by Derby, also marriage William Peach to Ann Gardiner 23rd July 1799 Eggington, Derbyhire. Throughout the ages prisoners of war have made arts and crafts to pass the time, to sell to guards for extra food and occasionally as a ‘thank you’ for families who had looked after them. Although games and puzzles have a long history, it was in the 18th Century that leisure pursuits became very popular. The fretwork lid covers the ornate chest while the inner lid slides out reveal the dominoes. The 55 domino pieces have an extended numbering system to the highest value of 9 spots (or pips). We are looking into conservation of this piece as the hinge on the lid is broken. When this mechanical egg timer turned up at an auction house in Lichfield we just had to have it. It shows the diverse talents of the Whitehurst family and is a quirky addition to our collection of clocks and barometers. The number ‘5969’ suggests a date of 1840 so a little late for John Whitehurst (1713-1788) and possibly made by John Whitehurst III, his great nephew who continued the family business. We were advised that the outer box may be a later refinement as they were usually free standing, however it would need some form of stability. The timer still works but the hammer isn’t connecting. 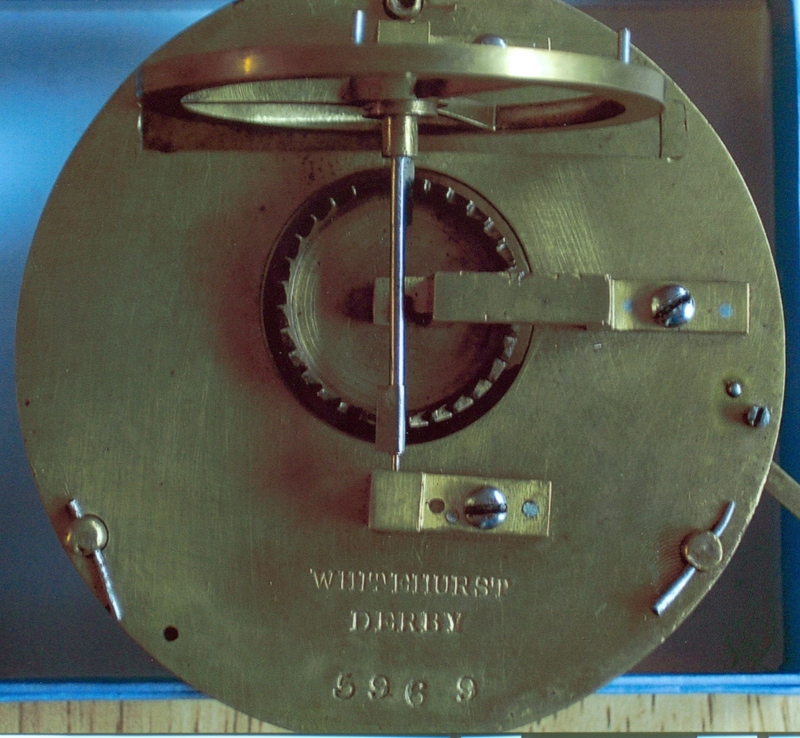 We have also purchased a rare Whitehurst Angle Barometer and a Noctuary Clock as part of the Enlightenment! project.